Read my original MicroServer intro post right over here! The eagle-eyed among you will notice that there are four drive bays in the HP MicroServer, and yet I have managed to squeeze six drives in there. Not really that impressive, to be sure, but still a decent effort. If you’re prepared to forego your 5.25″ bay and optical drive, essentially you’re after something like the Nexus DoubleTwin (sorry, PC Case Gear don’t seem to stock it anymore?) or the OWC MultiMount. Same thing, different name — it’s just something that mounts in your 5.25″ bay and allows you to fit two standard 3.5″ drives in there. 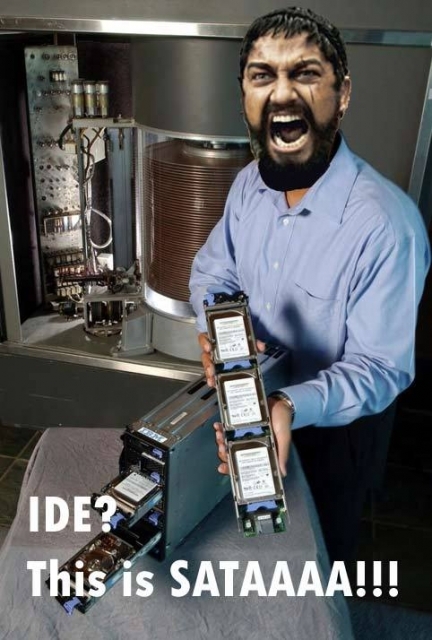 What about the SATA end of business, you say? 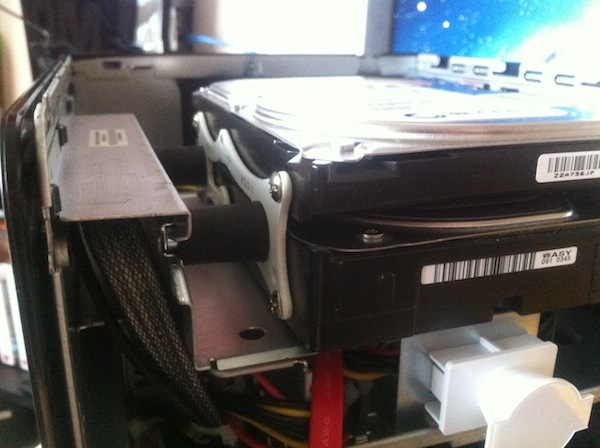 The good news is that there’s technically two extra SATA ports you can use — one is internal and designed for the optical drive in the first place, and the second isn’t a SATA port and it isn’t internal. Instead, it’s an eSATA port and it’s located on the outside. The bad news is that these ports are also locked to SATA I speeds, which means a max of 1.5Gbps speeds from those ports — not a huge concern if you’re just using those ports for boot or storage drives, but you don’t want to be limiting your RAID array if you’re adding those drives to an array. Luckily, there’s an OCAU post that contains the instructions to flash a modded BIOS to the machine to fix that right up. If you’re thinking of getting one of these machines, do this BIOS flash first, then start putting in drives and setting up software and whatever else. I know it sounds potentially dodgy, flashing a modded BIOS and all, but you can always re-flash back to stock if you find that you want slower array speeds. Plus, plenty of people have been running that modded BIOS without any issues at all, so it should work just fine. I’ll cross my fingers for you, anyway. Oh, and that other eSATA port on the back? You just need an eSATA to SATA plug, and extra molex splitter or two, and away you go. Easy, right?